Marco Rubio took jabs at Donald Trump in a statement announcing he would jump into the Florida Senate race and attempt to retain his seat. 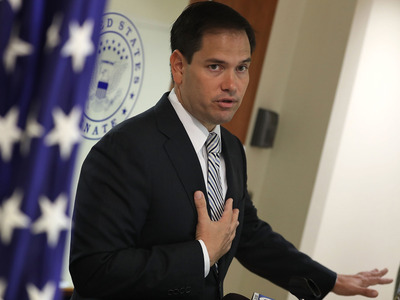 “But as we begin the next chapter in the history of our nation, there’s another role for the Senate that could end up being its most important in the years to come: The Constitutional power to act as a check and balance on the excesses of a president,” Rubio wrote. After outlining why he believes a Hillary Clinton administration would provide “four more years” of the same “failed” policies of President Barack Obama, he zeroed in on Trump, his party’s presumptive presidential nominee. Rubio initially said he would not seek reelection to the Senate after launching his presidential campaign last year. But in recent weeks, he started to show signs of reconsidering, leading to his Wednesday announcement that he would indeed run for reelection.